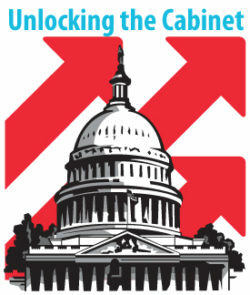 WHAT IS UNLOCKING THE CABINET? On the cabinet level, women hold a net average of 31% of appointments in the states. In some states, such as Texas and New Hampshire, not a single cabinet seat is held by a woman. “Traditional” positions are still the rule, with women holding more than 50% of cabinet positions in areas such as education and human services and less than 20% in areas such as military affairs and corrections. This new report examines women’s status in state cabinets nationwide, identifies trends in women’s appointments and provides specific advice on tapping women’s talent for these critical management seats. She Should Run set out to understand the status of women in the most influential state-level appointed roles with the launch of our research, "Unlocking the Cabinet: Where Women Stand in State Appointments and Where We Need Them to Go." The results revealed that gender equity in appointments is attainable, but requires a firm commitment from governors and their staff; partner organizations; and women seeking appointments. In many senses, appointed leaders run the state. They oversee a broad array of policy areas and functional operations, ranging from education and healthcare to utilities and lotteries. In some states, it takes thousands of appointees to get these jobs done. Appointees control the cash. In an average state, cabinet leaders collectively manage $12.5 billion of the state’s budget. Women appointees make a difference. By appointing women, savvy governors ensure the perspectives of women and families are equally represented. These governors wisely utilize the talents of their state’s women to produce more expansive policies, processes and outcomes.